Thimbleberry is in the Rosaceae (Rose) family and is in the same genus (Rubus) as raspberry, blackberry, loganberry, boysenberry, tayberry, dewberry and many others. Rubus fruit are an aggregate fruit composed of small, individual drupes, each individual is termed a drupelet. In a sense they are many little berries grouped together to make one large berry. This bush has broad soft leaves that can be used to make a quick pouch for holding berries you have gathered and provide a practical solution to assist you during your bathroom duties. Distinguishing Features: The thimbleberry is a dense shrub that grows up to 2.5 meters (8.2 ft) tall with canes no more than 1.5 centimetres (0.59 in) in diameter, often growing in large clumps which spread through the plant's underground rhizome. Unlike many other members of the genus, it has no prickles. The bark is distinct in that it peels in tiny fragments. Flowers: Between May and early July, clusters of 2 to 7 showy 4cm (1.5”) flowers develop. These white flowers are pollinated by insects, after which berries develop. 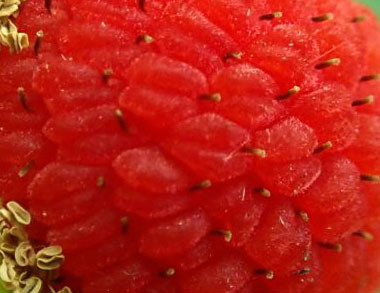 The berries turn from pink to scarlet when fully ripe and are soft, cup-shaped and full of tiny seeds. 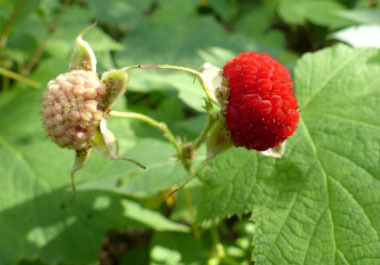 Fields of Nutrition has medicinal benefits and vitamin/mineral content of Thimbleberry. Leaves: The sizeable palmate leaves measure between 10 and 20 cm (4” to 8”) across with five lobes that are somewhat reminiscent of a maple leaf. Fine hairs are on both of the leaf, making it soft to the touch. 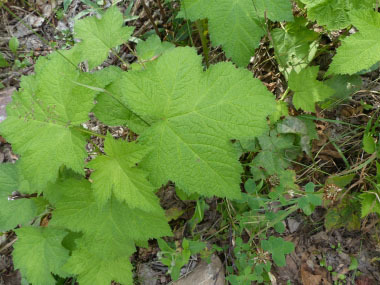 No other member of the Rubus family has this characteristic leaf. 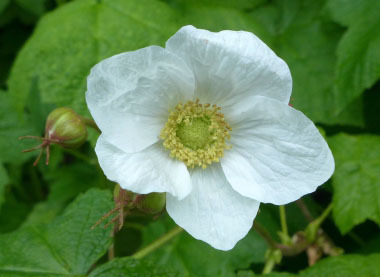 Height: Thimbleberry is an upright shrub with multiple, thornless stems, or canes reaching heights of 2.13 metres (7’). Habitat: The thimbleberry is found from Alaska, south to California, in the mountain ranges of New Mexico, east all the way to the Great Lakes and north to the 55˚ N latitude. 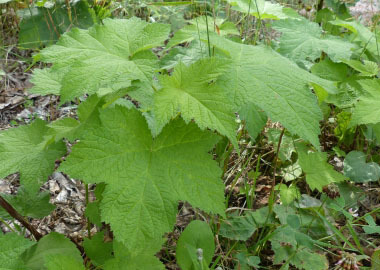 Thimbleberries can tolerate partial to almost full shade, although the shrubs will grow more lush with more light. They can be found at lower elevations in moist areas at a forest's edge and in forest clearings. It is native to the North American west coast. Thimbleberry also grows in the UK, Denmark, Czech Republic, Finland, Ireland, Latvia, Norway, Sweden, Ukraine and in Australia (Queensland, WA, Victoria and Tasmania). 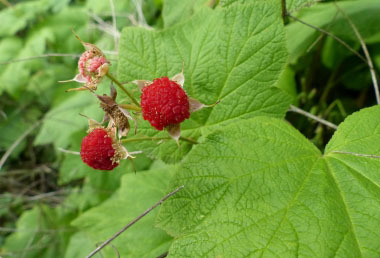 Edible parts: Thimbleberry fruits are smaller, flatter, and softer than raspberries, and have many small seeds. Like many of the other Pacific Northwest berries, thimbleberry was commonly eaten by the Native Americans. 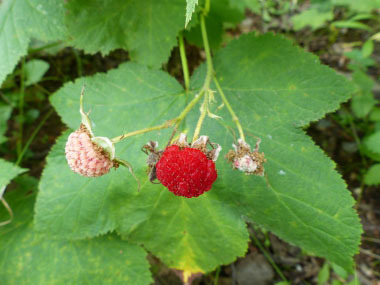 Thimbleberry is a great source of vitamins A and C with traces of potassium, calcium and iron.This berry helps to boost the immune system.The young shoots, roots and leaves have been used to treat many ailments. A tea is made of the leaves or roots as a blood tonic in the treatment of nausea, vomiting, diarrhea and dysentery. Its effects are believed to tone and strengthen the stomach helping increase appetite. Both the leaves and the bark of these plants have astringent properties.